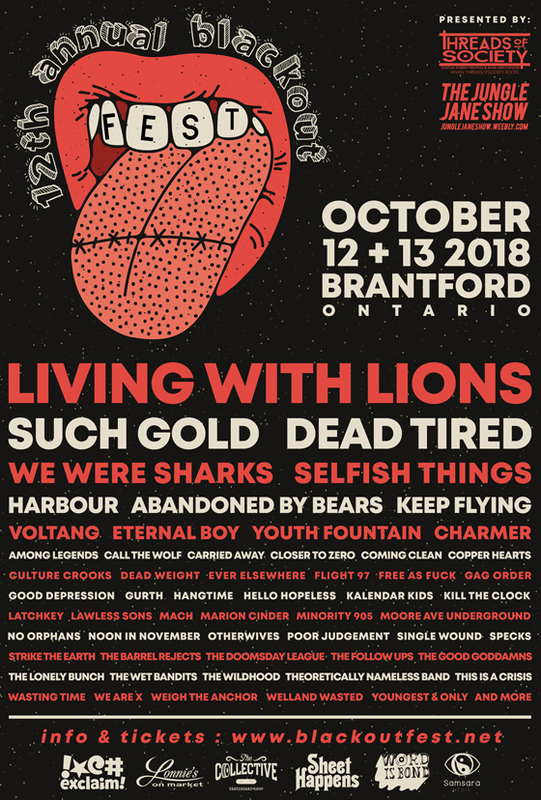 Brantford, ON's Blackout Fest is set to return to the city for its 12th edition this fall, and organizers have lifted the curtain on the punk-packed lineup for this year's event. Living With Lions top the bill for this year's festival, followed closely by Such Gold, Dead Tired, We Were Sharks, Selfish Things, Harbour, Abandoned by Bears and Keep Flying. Others set to play the festival include Voltang, Eternal Boy, Youth Fountain, Charmer and more than 50 national and regional bands. The 2018 edition of Blackout Fest is set to take place October 12 and 13 at the city's Club NV. Early bird passes can be had for $30 each and are on sale now. Further ticketing and festival information can be found through Blackout Fest's official site. Living with Lions Team Up with Youth Decay, Dangercat for "Bros of the Snow Tour"